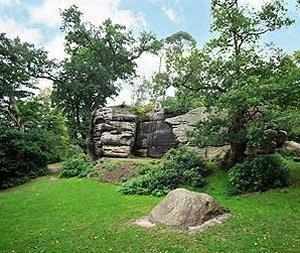 The High Rocks01892 515532work Country ParkAcres of magnificent sandstone rocks interlinked with bridges and providing a scenic walk in a tranquil woodland setting. Once a Stone Age camp, these rocks are steeped in history, dating back millions of years and are now a National Monument. Refreshments available at High Rocks Complex opposite. Open daily from 10:00 until dusk except Boxing Day. Entry tickets available from the High Rocks Pub. Acres of magnificent sandstone rocks interlinked with bridges and providing a scenic walk in a tranquil woodland setting. Once a Stone Age camp, these rocks are steeped in history, dating back millions of years and are now a National Monument. Refreshments available at High Rocks Complex opposite. Open daily from 10:00 until dusk except Boxing Day. The High Rocks is a popular, world renowned location for Rock climbing. Entry to the Rocks for climbers costs £5, or regular visitors may wish to take advantage of our annual membership fee of just £35. There are two very informative books available, SOUTHERN SANDSTONE and SANDSTONE SOUTH EAST ENGLAND, both of which beautifully illustrate the climbs, and offer a comprehensive guide to sandstone climbing in the area. Open every day from 10.00am to dusk. Nearest major road is A26. Located 1.5 miles south of Tunbridge Wells. Signposted from town centre.